I have a form on a special event website as the RSVP and it's now saying the form has exceeded it's allocated quota. 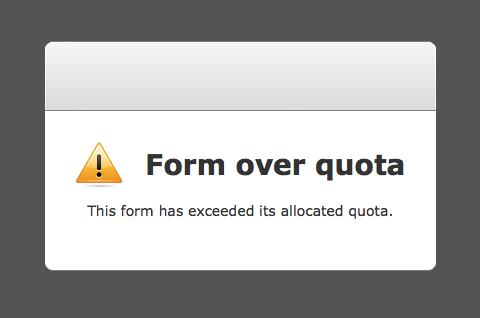 When building the form, I was not informed that there WAS a quota - I would not have used the program if I had been. I need my guests to be able to RSVP so I need this issue fixed ASAP, please. What can I do to reset the form and allow more RSVPs? Feel free to email or call me: 310-479-9000. We apologize for any misunderstanding. Of course, our free service has a quota because if we do not impose one, we wouldn't have any paid subscribers therefore we can't generate funds to finance our business operations. The quota for free registered users is stated in our home page, just below the Form Builder. Your form has not reached 100 submissions yet, but since you are using a Guest account (cookie-based), your form is limited to only 20 submissions per month. You must register for a free basic account in order to enjoy the 100 submissions limit. Please use the same email address you used for the form's email alerts so that the form will be carried over to your newly registered account. Anyway, when you reach the 100 submissions quota before the month ends, your form will be disabled again. In that case, upgrading to Premium or Professional shall increase your quota and re-enable your form. Hope this post answers your question.